I’m always happy when silly genre terms fall away into irrelevancy. Take “emo” for example. Ugh. I remember a time when (many) music snobs (I’m guilty) derided emo bands as too poppy. Too overwrought. Not punk enough. Fronted by Jared Leto. Well, I’m happy to see the term emo put to rest. It’s all good; I mean what’s not like? It’s catchy, melodic, heavy, fast punk music. And you know who makes quality ̶e̶m̶o̶. I mean, quality catchy, melodic, heavy, fast punk music? Toronto’s PUP. 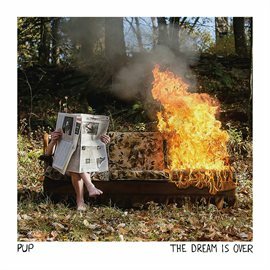 Check out The Dream is Over, their new album on Hoopla.